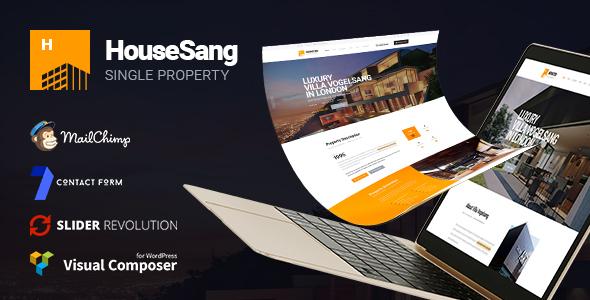 Firstly, HouseSang is a beautiful Real Estate WordPress Theme. Coming with 04+ Beautiful Single Property Homepages & Other Useful Other Pages & 1-Click Installation, HouseSang is a smart way to build promptly your Single Real Estate website more attractive and raise traffics drastically. Besides, HouseSang is not only a Single Real Estate WordPress Theme but also a powerful Real Estate Building Tool. With efficient efforts of Visual Composer, Revolution Slider, WooCommerce, Multiple Languages & RTL Support, numerous strong Plugins,…ensures to build/edit/customize rich Content, Layout, Background of Single Real Estate as you want. Your single property can be impressive with Slider, Amenity, Spectacular, Gallery, Videos, Virtual 360, Location, etc. Moreover, totally building on 100% WordPress Framework, this Single Property Real Estate Theme allows customizing any part of the theme to corresponding your need.